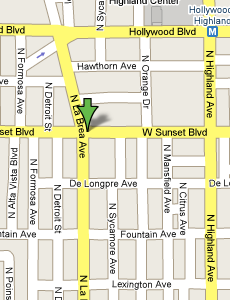 Welcome to the Open GPS Tracker site. 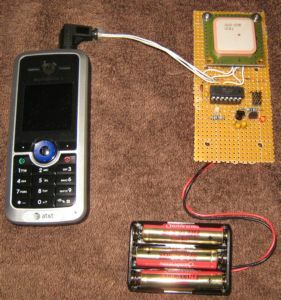 The Open GPS Tracker is a small device which plugs into a $20 prepaid mobile phone to make a GPS tracker. The Tracker responds to text message commands, detects motion, and sends you its exact position, ready for Google Maps or your mapping software. The Tracker firmware is open source and user-customizable. Build 19 has a dedicated car security mode with alarm inputs, remote starter disable, remote unlock, and remote horn/lights. Build 19 also includes detailed text alerting in remote I/O mode, and automatic power on/reset of the GC864 module. Click here for Build 19 feature details. We currently have third-generation stable firmware and a reference hardware design. This combination has been extensively tested in moving vehicles and found to be reliable. There have been no hangs since build 0.14, and no lost messages since build 0.17 was released. Kits and circuit boards are available from third parties. All parts are available from Mouser Electronics, and the phone is available from Target, Walmart, or Radio Shack. This site provides the firmware with source code, theory of operation, parts list, and exact assembly and checkout instructions. If you can solder, this is a one-sitting project. No PC board or surface-mount capability is required. If you want to build a tracker and do not have an AVR programmer, I will program a chip for you. Please contact me in email. We intend to have kits, PCBs, and/or assembled units available for purchase soon. The firmware will remain free and open source. We intend to support more phones and GPS devices in the future. SiRFstar III receiver gets a fix inside most buildings. Sends latitude, longitude, altitude, speed, course, date, and time. Sends to any SMS-capable mobile phone, or any email address. Battery life up to 14 days, limited by mobile phone. Longer life possible with external batteries. GoPhone costs $10 per month for 1000 messages per month. Configurable over-the-air via text message commands. Password security and unique identifier. 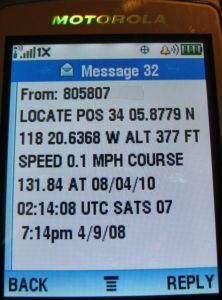 Manual locate and automatic tracking modes controlled via text message. when it stops moving, and at programmable intervals while moving. Alerts when user-set speed limit is exceeded. Retains tracking messages if out of coverage, and sends when back in coverage. Retains and reports last good fix if it loses GPS coverage. 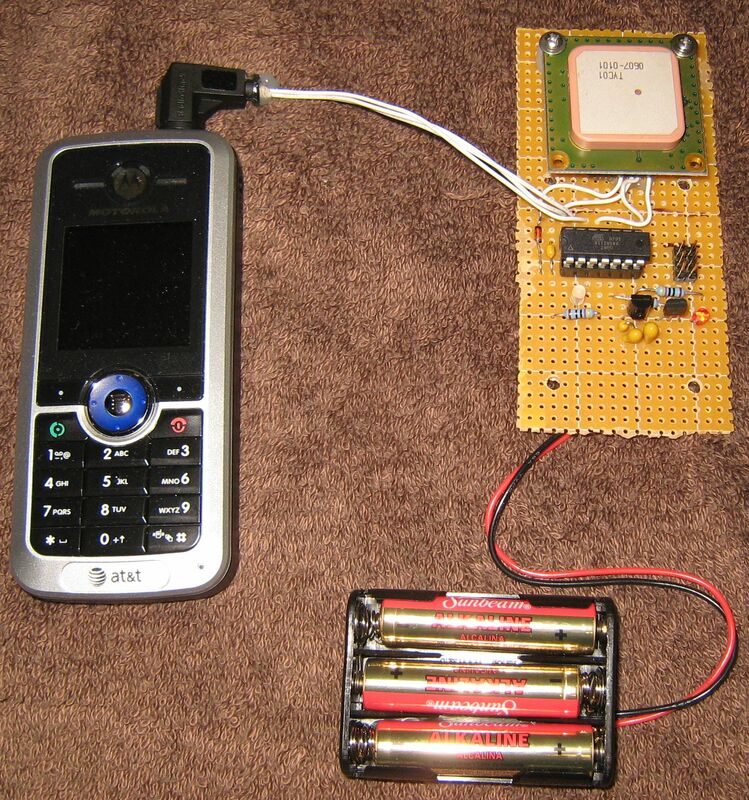 Remote reporting of mobile phone battery and signal status. Extended runtime mode switches phone on and off to save battery life. Watchdog timer prevents device lockup. Firmware is user-customizable with a $35.91 programmer and free software. In addition to being a GPS tracker, the firmware is easily modified to monitor and control anything from a weather station to a vending machine via text messaging. Please contact me for custom development. Contact email: mike <at> opengpstracker <dot> org or use the forum.